Things have been incredibly busy on the set of “Snow Guardians” over the past two weeks. The entire crew has been hard at work developing the story by gathering close to 16 hours of rescue ski patroller, avalanche scientist, and search and rescue interviews at Bridger Bowl and Yellowstone Club ski resorts. Moreover, the entire crew, to include CamBlock experts Aaron Caughran and Jason Hess, filmed breathtaking sunrise, sunset and astro motion control timelapses, GoPro fresh powder ski chase camera footage and hours of breathtaking vistas shot on Canon HDSLRs with Kessler Cinesliders in the beautiful Montana Rocky Mountains. Everyone on the crew has pulled together to make the most of each day and contribute their time and energy to tell an incredible story. “Snow Guardians” is a powerful and visual story focused on avalanche awareness and snow sport safety which highlights brave rescue ski patrollers who put their lives on the line each and every day to keep the mountain safe for millions of people around the world. An avalanche can bury you alive in less than 10 seconds and leave you unconscious due to lack of oxygen. They are an extremely powerful force of nature. If you enjoy adventurous mountain sports but aren’t educated on avalanches and don’t take them seriously then you are putting your life in great danger. Avalanche scientists, search and rescue experts, and rescue ski patrollers will educate you on how to plan for the worst and how to save your life if you are caught in an avalanche. Moreover, these experts will demonstrate what steps are taken behind the scenes to keep you and your family safe. I want to stress the importance of storytelling in this blog post. Telling a story that hasn’t been told before is always a challenge but it’s so important that everyone on the crew is on the same page before filming begins. During the very first crew meeting everyone agreed that we needed to focus on telling a unique and powerful story that has never been told before and use all the incredible gear to enhance the story instead of using the gear just because we had access to it. Now, every producer, director, DP and crew will say it’s all about the story, it’s all about the story, it’s all about the story. However, very quickly big budget productions can take a wrong turn and focus on money/budget, overused gimmicky techniques or force the crew into meeting unrealistic deadlines and settling with less than perfect locations/shots that aren’t up to par with the Director and/or DPs vision for the film. In all these situations you sacrifice the story for something else that is less important. Patience and perfection is key! This is how the Collaborative Film crew is able to shine! The schedule has been flexible and creative freedom is given to every single member of the team. The entire crew brings their creativity, expertise and talent to the table and openly shares their tricks for everyone to learn. In addition, any crew member can play the role of any position at any time. One day you might be helping produce and coordinating logistics/scheduling and the next day you could be directing or DPing a sequence, shooting timelapse, editing footage, photographing behind the scenes, recording audio, interviewing a patroller, and the list goes on and on. This unique way filmmaking can be very challenging at times since the crew has to wear so many hats. With great communication and a passion to make the story unique, everyone on the crew has risen to this challenge and made the most out of every single day. This goes against a typical structured set and can ONLY work if you have the right type of people who will pull together to make the film great. The best motivation for empowering every last person of a team can be found by studying how Pixar operates. Ed Catmull describes great people being much more important than great ideas in his powerful and inspirational “Keep Your Crises Small” speech that he presented to the Stanford Business School. The Collaborative Film crew agrees 100 percent with Ed Catmull. It’s all about the people you surround yourself with and we have been so lucky to have an incredible crew with so many different talents and so much passion. It’s important to note that every single crew member has volunteered their time and talent to be a part of this project. 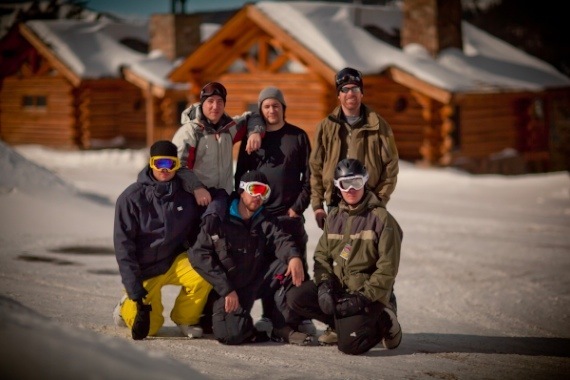 None of the crew is getting paid a day rate and they all paid their way out to Montana to be part of this film. This demonstrates the passion in each and every crew member who volunteered their time to be here. Each of our crew members in one way or another is personally connected to this story and connected through the power of social media to be a part of something bigger than themselves. Some crew members have always loved ski/snowboard films, some grew up and lived their childhood skiing in the Montana mountains, and one crew member was actually involved in an avalanche. This type of filmmaking is so different than traditional filmmaking which can be detrimental to creativity when all you worry about is time and money. There is something much more powerful than time and money when you take creative and passionate human beings and put them together in one location and let them run free with their ideas. This is the true power behind Collaborative Filmmaking! So with all this freedom how does the crew stay on track? Each night there is a production meeting and the crew goes over the footage, interviews, and what each crew member did to contribute to the film. The crew also gives one another feedback on what went right and what went horribly wrong. We learn from each others mistakes, listen to one another and make adjustments so the next day goes smoother. We also discuss in detail what we plan to do the next day and go over what teams will cover what shots in order to stick to the production schedule. We keep the meetings short and empower everyone that is involved. We challenge one another to step up our game and push the bar to the next level. Most importantly we have fun and crack jokes with one another often through hashtags on Twitter. This concept of collaboration and creative freedom is incredibly powerful. I will walk you through a real world example of why this type of filmmaking is so different. This week we had an incredible opportunity to film at the Yellowstone Club. 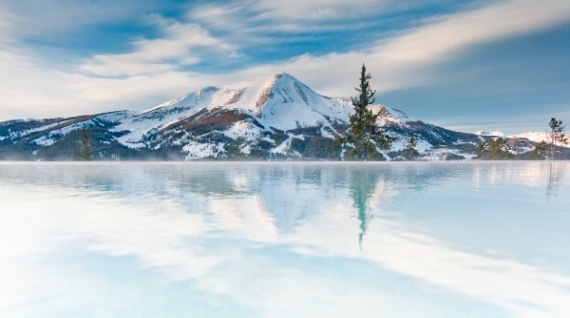 We want to thank everyone at the Yellowstone Club for being so cooperative and helpful with anything we needed. Their entire staff and all their ski patrollers were extremely professional and went out of their way to help coordinate and schedule any shot or interview we needed. So, back to the benefits of a Collaborative Film. On Wednesday we scheduled to shoot the open to the film. The original plan that we had talked about for several weeks was to film a wake up scene. As we got closer and closer to the actual day of filming several crew member including Brad Burke, Chris Dowsett and Jim Geduldick voiced their concerns about doing yet another wake up scene just like every other ski/snowboard film… Regardless, we were on a time crunch and we had already coordinated with a rescue ski patroller who was volunteering 8 hours on his day off to film the wake up scene in his house. We had it all planned out and ready to go but we were missing one important thing, a recon of his house. When Tyler Ginter, Jon Bregel, Khalid Mohtaseb, Brad Burke and James Douglas Shields showed up at the rescue ski patroller’s house the night before the shoot, the house didn’t fit the look of the rest of the film and DPs Jon and Khalid did not want to force this location and were quickly losing motivation. Now under normal conditions any other producer would have said to make it happen and stick to the plan. However, everyone talked to the director and producer, Carson Ganer, and we all agreed that the opening needed a fresh new look and the wake up scene needed ditched. At this point it was almost 11pm on Tuesday night and we were running out of time to film the opening scene at the Yellowstone Club. We all knew we needed to make the most out of Wednesday but we didn’t know how. So, we all got together and did a brain dump of ideas to figure out how to make the story fit together. Once again, major focus on storytelling! That night everyone agreed that we could at least film a ski patrol reenactment as they rescue a victim with a broken leg. Khalid would use his experience as DP on the ABC Pilot “Final Witness” to tell the story and get the shots. Everyone went to bed feeling better that we wouldn’t have to film the wake up scene but we were all still unsure of how the next day would unfold. Tyler woke up at around 5:30 AM the next morning with an idea. He wanted to open the film with a reenactment like the crew decided on the night before. 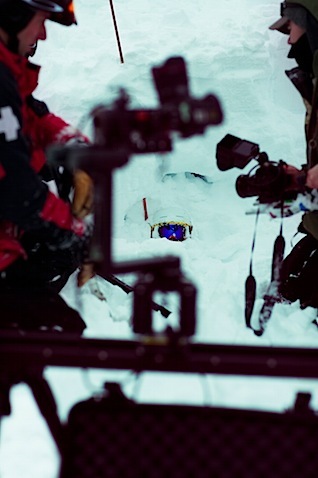 But instead of a broken leg, he thought it would fit the story better if the crew filmed an avalanche rescue with an actually survivor who was buried 1 meter deep in an avalanche several years prior. He took thorough notes, created a shot list, put together a schedule for the day and woke up James at 6:45 AM to go to the 7:30 AM ski patrol meeting to brief the plan and coordinate the scene for later that day. 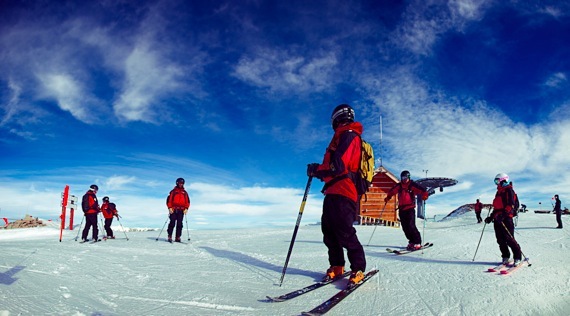 The ski patrollers helped Tyler and James find the perfect location to film and provided all the resources they needed. Tyler then coordianted with the survivor who luckily agreed last minute to be completely buried (again) in a reenactment scene. In less than 3 hours of planning and coordination and 4 hours of intense filming, the Collaborative Film crew completed a powerful opening to the film. This would have been almost impossible to pull off in such a short amount of time with a conventional/structured film crew. So to sum things up, we may have a ton of great gear out here (we have an in-depth gear overview post coming in a few days covering the gear we have been using on the Collaborative Film set) but gear can only get you so far. It’s so important to focus on the story and have a strong crew to make that story come to life. Speaking of the story, we had the rare opportunity of sitting down with legendary filmmaker Warren Miller a few days ago at his home in Yellowstone Club. We told Warren about our film and he gave us some advice. He told Brad, Khalid, James and myself to keep it simple and to tell a story. 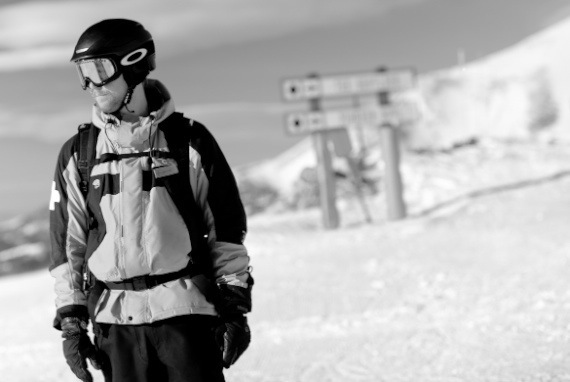 He said that there are far too many ski/snowboard films these days that have no plot. We took that to heart and Warren seemed to think we were on the right track! It was such an honor to meet Warren, he is such a great guy. We have a lot left to film so this week is going to be another busy week. 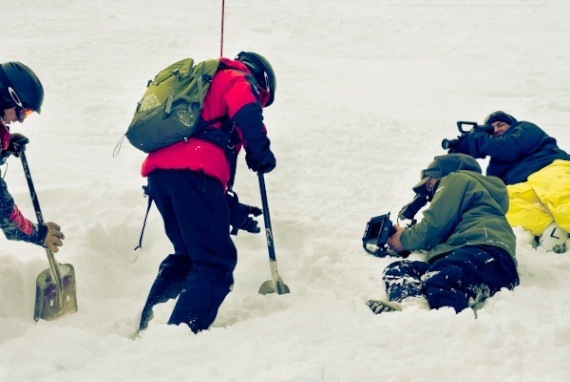 We are already booked solid through the end of the month to film interviews with avalanche science experts, rescue ski patrol dog handlers, and search and rescue helicopter pilots. The second group of filmmakers will be out this week to include Pulitzer Prize winner and Hollywood filmmaker Vincent Laforet, high mountain cameraman, Colin Witherill, who was an intern for Warren Miller and who is making a second trip back after he did an incredible job after only a few days on set before he had to go back to work on another job, Devon Boulton-Mills, friend of Chris, is a freelance adventure photographer who will be driving down from Canada this week, and several other expert filmmakers who are on their way. Keep in mind if you’re a filmmaker, editor, VFX guru, motion graphic artist, etc. and you’re passionate about filmmaking and interested in helping out please Contact Us. It’s going to be another amazing week! Please keep checking for updates on the Collaborative Film website and follow @F9photo and the entire crew on Twitter for the latest updates on the film. Thanks so much to our incredible crew, all our amazing sponsors, and anyone out there who is reading this blog and supporting the project. Special thanks to Chris for all the behind the scenes photos.